The Mexican government seems torn between stopping several thousand Central American migrants from traveling toward the U.S. border in a caravan or burnishing its international human rights image. Police let the caravan proceed after representatives from Mexico's National Human Rights Commission convinced them that a rural stretch of highway without shade, toilets or water was no place for migrants to entertain an offer of asylum. Many members of the caravan have been for more than two weeks, since a group first formed in San Pedro Sula, Honduras. Not long after the caravan resumed the trek north Saturday, government officials were seen for the first time directly helping the migrants by giving rides in trucks and providing water along the scorching highway. Martin Rojas, an agent from Mexico's migrant protection agency Grupo Beta, said he and his fellow agents planned to use agency pickup trucks to help stragglers catch up with the caravan. "There are people fainting, there are wounded," said Rojas, who spoke to The Associated Press after dropping off a group of women and children in Tapanatepec, where the caravan planned to spend the night. Rojas transported the group to their destination after spotting them on a highway trudging through temperatures approaching 104 degrees Fahrenheit (40 degrees Celsius). Mexican President Enrique Pena Nieto launched a program on Friday dubbed "You are home," which promises shelter, medical attention, schooling and jobs to Central Americans who agree to stay in the southern Mexico states of Chiapas or Oaxaca, far from the U.S. border. Mexico's Interior Ministry said that temporary identity numbers have been issued to 111 migrants under the program. The IDs, called CURPs, authorize the migrants to stay and work in Mexico, and the ministry said pregnant women, children and the elderly were among those who had joined the program and were now being attended at shelters. After another brutally hot day on the road with her husband and 8-year-old son, Alejandra Rodriguez said the possibility of health care and a work permit in Mexico sounded enticing. But as she laid out a tarp and blanket to sleep in a covered parking area in Tapanatepec, the 26-year-old from Tegucigalpa, Honduras said she'd prefer to start a new life further north. She had heard that job opportunities were scarce in southern Mexico. Orbelina Orellana said she and her husband were determined to continue north as well. "Our destiny is to get to the border," said Orellana, who left three children behind in San Pedro Sula. She was also suspicious of the Mexican proposal, fearing that she would be deported if she applies for asylum in Mexico. Mexican officials have greeted the caravan with a mixture of hospitality and hostility. Several mayors have rolled out the welcome mat for migrants who reached their towns — arranging for food and . At other times, police have ejected migrants from passenger buses or prevented smaller groups from joining the caravan. 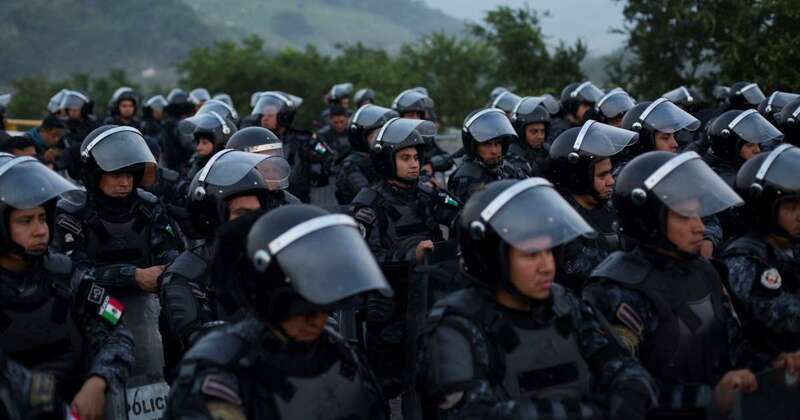 An official with the national immigration authority said Friday that 300 Hondurans and Guatemalans who crossed the Mexico border illegally had been detained. The group was walking in broad daylight, far from the main caravan. This year's caravans have earned the ire of Trump. The Pentagon approved a request for additional troops at the southern border, likely to total several hundred, to help the U.S. Border Patrol as the president seeks to transform concerns about immigration and the caravan into electoral gains in the Nov. 6 midterms. Stoking fears about the caravan and illegal immigration to rally his Republican base, Trump insinuated that gang members and "Middle Easterners" are mixed in with the group, though he later acknowledged there was no proof of that.